« Winter Saturday and Tuesday Watercolour Classes – Week Three! 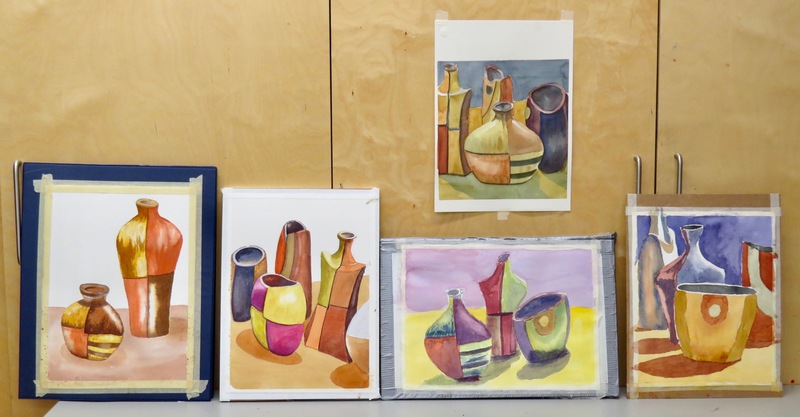 What better way to spend a Wednesday evening than to paint watercolours from the still-life at the Dundas Valley School of Art? I’ve had these geometric ceramic objects for a long time. They’re fun to paint but, even better, they can be broken down into their component shapes much like the teddy bears from last week. This offers an opportunity to practice soft-edge washes with the shapes and that was the focus of my demonstration. I painted a shape at a time, following a ‘light to dark’ and ‘big to small’ process. The smaller, textural strokes came last. I’m quite pleased with the student’s work and their progress over our seven evenings together. There’s only one more class to go! I’ve got another interesting still-life planned. See you next week. This entry was posted on 01/03/2018 at 11:46 am and is filed under Barry's Demonstrations, Dundas Valley School of Art, Studio Classes. You can follow any responses to this entry through the RSS 2.0 feed. You can leave a response, or trackback from your own site.